How many flights are associated to a particular airport? Click here to find out. 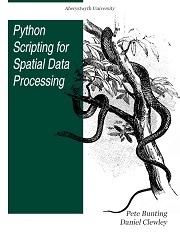 This book is a Python tutorial for beginners aiming at teaching spatial data processing. It is used as part of the courses taught in Remote Sensing and GIS at Aberystwyth University, UK. Geographic information systems belong the group of applications that process spatial data. Some spatial analyses are operated repetitively in the same way for different area or district. Therefore it is useful when the data processing can be run automatically by program extension designed especially for batch data processing. We use Python to automatically convert data flow diagram into the program code, using psycopg2, and ogr2ogr, etc. Python is a high level scripting language which is interpreted, interactive and object-oriented. A key attribute of python is its clear and understandable syntax which should allow you to quickly get up to speed and develop useful application, while the syntax is similar enough to lower level languages, for example C/C++ and Java, to provide a background from which you can grow your expertise. Python is also a so called memory managed language, meaning that you the developer are not directly in control of the memory usage within your application, making development much simpler. That is not saying that memory usage does not need to be considered and you, the developer, cannot influence the memory footprint of your scripts but these details are out of the scope of this course. Python is cross-platform with support for Windows, Linux, Mac OS X and most other UNIX platforms. In addition, many libraries (e.g., purpose built and external C++ libraries) are available to python and it has become a very popular language for many applications, including on the internet and within remote sensing and GIS. Python can be used for almost any task from simple file operations and text manipulation to image processing. It may also be used to extend the functionality of other, larger applications. Dr. Pete Bunting joined the Institute of Geography and Earth Sciences (IGES), Aberystwyth University, in 2004 for his Ph.D. where upon completion in the summer of 2007 he received a lectureship in remote sensing and GIS. Daniel Clewley is now at Plymouth Marine Laboratory (Devon, UK). His research investigated uncertainty for time-series remote sensing classification in wetland areas, focusing on detecting decadal change using JERS-1 and PALSAR data.